The West Valley of Phoenix, Arizona has so many eateries and drink-eries painfully bereft of any kind of personality or humanity. It’s sad to the point of embarrassing to think that there are so few really great family owned spots sparsely populated among restaurants and bars created from a boardroom approved template and coming with as much personality as an office supply store. What I’m searching for is a place not mandated by corporate ghosts so far up the proverbial ladder, people aren’t really sure they exist. It’s been maddening to see a new restaurant pad with hungry hopes of a new place to try only to see another chain restaurant and publicly traded, food service conglomerate terraforming the place I call home. A storm was on it’s way when I left work set to do battle wandering the West Valley wasteland of the derivative in search of the rumored special ale shop I heard had just appeared on the world map. Pressing Start to bring up the (Google) map, following the destination marker, fighting my way through all enemies and at the end of my journey, I was rewarded with the honest-to-goodness, winsome treasure called 8-Bit Aleworks. Cue the Legend of Zelda secret discovery music and Final Fantasy victory fanfare. I had first heard of 8-Bit Aleworks a year ago from a friend who attended Phoenix Comic-Con 2014. Stating that they were still setting up shop and to check back soon. Having grown up in the “bit” era of gaming, I was attracted to both the nostalgia and the mystery of its newness. It was literally a dark and stormy night when I first found and entered 8-Bit. The upstart, clean and charmingly simple tasting room with several tables, about ten bar stools, some classic gaming music playing from a small stereo and awesome 8-bit artwork on the walls all of which are for sale from the local artist Chris “EightBit” Olian. I was immediately greeted and welcomed by Krystina, took an empty seat at the bar, perused the large chalkboard menu and ordered a White Mage. I saw Ryan working in the back cleaning and moving equipment. The brewery has been in the works for over two years but Ryan has been brewing for over eleven and just recently quit his corporate job of eight years to focus full-time on the brewery. The husband and wife team are putting their all into this business and took all of a moment to see they’ve worked so hard even before the opening of the tasting room. Giving thoughts to the details such as the purposeful lack of big screen televisions as the owners want an atmosphere that breeds interaction and conversation between guests. I can tell they care and are excited to let patrons know their future plans for the brewery. Finally, not just a brewery but an interesting brewery with excellent beer in the West Valley. Merchandise for sale are attractive, logo branded 32 ounce, 1-player growlers with rumors of a larger 2-player growler coming soon. They look like old medicine bottles you’d find in a hospital a hundred years ago which is quite a propos of their “it’s note a beer, it’s a health potion” slogan. Black branded t-shirts and sturdy pint glasses are also for sale. For now the brewery itself is already awesome in its alpha stage and will no doubt become even greater but I would like it just the same if it never changed at all. I’m more excited by the fact that my friends and I finally have a chill place we can go to just have a few craft beers. A place without some frightened yet plucky server hellbent on selling us mozzarella sticks or potato skins. Only smiling because they have a cattle prod named “standard operating procedure” about to jab their ribs if they deviate from the script or display any kind of a soul. As you can tell from my disdain of the omnipresent corporate chain, I’m pretty happy this place has opened up. I really appreciate the risk Krystina and Ryan took and wish them all the best moving forward. They’re seriously super nice, knowledgeable and down-to-earth. They along with “EightBit” Olian will be at Phoenix Comic-Con so make sure to check out their booths and head on over to 8-Bit Brewery. They will be having their official opening on Saturday, June 6th so be sure to attend. I know I’ll be there. 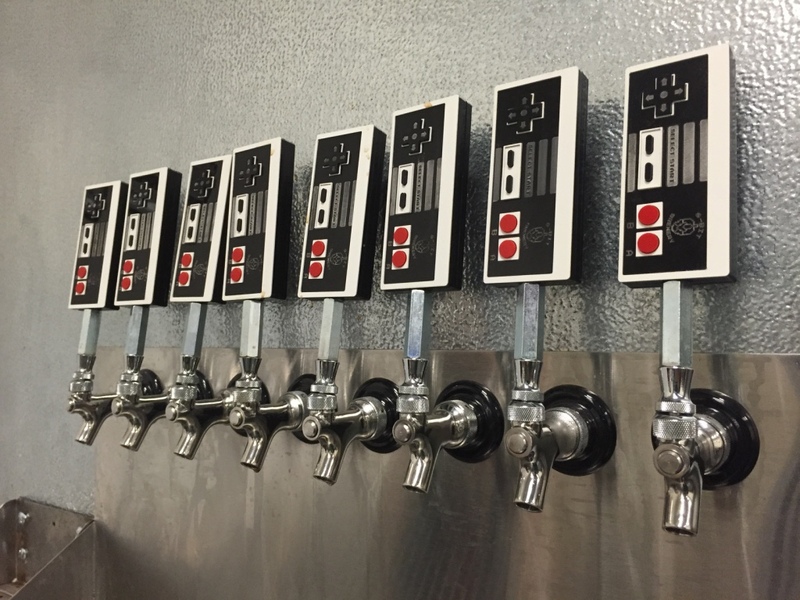 8-Bit Brewery is located on 127th Avenue south of the I-10 in Avondale Arizona. 1050 Fairway Dr. Avondale, AZ 85323. Some great work from Chris Olian. I just got a chance to read through the article, and I just wanted to say thank you, so, so much, for your kind words. It really means a lot, and it sounds like we’re doing exactly what we set out to do. I’m so happy to hear you loved it, and hopefully we’ll see you again soon! Thank you for sharing! Cheers! No need to thank me at all. I love this place and look forward to going to the official opening this Saturday. Just keep doing what you’re doing, be genuine and so long as you’re having fun, great things will come your way. See you at 8-Bit.